Juanita León was born in Colombia and graduated from law school before moving to New York to do a masters degree in Journalism at Columbia University. After her studies she worked as a reporter on the Wall Street Journal before returning to Colombia in 1998. She worked as an editor for the country’s largest daily newspaper, El Tiempo, and then for Unidad de Paz, that paper’s special supplement on the peace process in Colombia. In 2000 she began to work as a reporter and editor at Colombia’s most important current affairs weekly La Semana, covering in particular the armed conflict in the country. She then worked as the editor of that magazine’s online publication, semana.com. She has also worked as an investigative reporter for the TV series Tiempos dificiles and Regreso a la Esperenza. León was the editor of Años de fuego (2001), an anthology of the best Colombian reportage from the 1990s. In 2004 she published No somos muchos pero somos machos, a collection of her reportages on civil resistance by Colombia’s indigenous people. 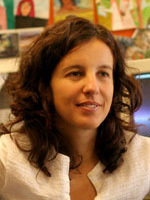 Her work has also appeared in many journalism anthologies: most recently an article on paramilitary atrocities was included in the collection Lo mejor del periodismo de América Latin (2006). Her book País de plomo. Crónicas de Guerra [Country of Bullets. War Diaries] (2005) is a detailed portrait of the victims and protagonists of Colombia’s deadly armed conflict at the beginning of the 21st Century. She travels to different parts of this dangerous war-torn country, and describes the suffering of the rural population, the ravages of the death squads, the incompetence of the government, the conflicts between the army, the left-wing guerrillas and the paramilitaries, the role of the drug economy and the increasing loss of humanity. León won the World Health Organisation’s World Prize for Health Journalism in 2001 for an article on the health risks posed by the conflict in Colombia, and was a finalist for the Fundación para un Nuevo Periodismo Iberoamericano - Cemex journalism prize in 2002. She teaches journalism at the Universidad de los Andes in Bogotá and was a founding member of the NGO Opción Colombia which organizes voluntary youth projects. She was named a Nieman Fellow by Harvard University in 2006 and is currently working there. Juanita León lives in Bogotá.